There are at least 33 species of rattlesnakes. Most are of the genus Crotalus, although three are of the genus Sistrurus. They are members of the family Viperidae and the subfamily Crotalinae -- the pit vipers. The Gaboon viper, Bitis gabonica, is a single species only, divided into two subspecies. It's also a member of Viperidae, but is a so-called "old-world viper." All rattlesnakes live in North America. Members of this diverse group inhabit deserts, prairies and dry mountain forests. The Gaboon viper lives in wet, humid forests in Africa. Rattlesnakes tend to den underneath logs and rocks or in caves and crevices. Some live in underground burrows. One species, the sidewinder, is often found on open land. Gaboon vipers prefer to bury themselves in leaf litter on the forest floor. 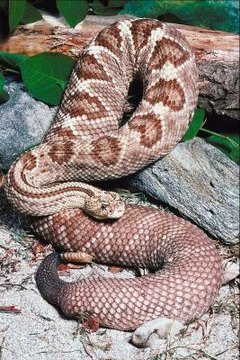 Both rattlesnakes and Gaboon vipers use their venom to kill prey, feeding on small mammals, birds and amphibians. Some rattlesnakes eat other reptiles, especially lizards. Rattlesnakes are called pit vipers because they have heat-sensing "pits" underneath their eyes, which they use to hunt and pursue prey. Gaboon vipers are ambush predators, waiting for dinner to stumble upon them. Both types of snake have hemotoxic venom, meaning it primarily attacks blood cells and muscle tissue. Part of its function is to predigest prey. As you can imagine, this causes a great deal of tissue damage. Only a minority of rattlesnake bites, however, are fatal. Being bitten is no fun -- the bites are said to be unbearably painful, and the venom can cause gangrene. Treatment often includes wound debridement, a painful process of scraping rotted flesh away, sometimes down to the bone -- but you'll probably live. Gaboon viper bites are a different story. While these vipers also have hemotoxic venom, they deliver it with the largest venom glands and longest fangs of any known snake and tend to bite repeatedly. Gaboon viper bites are frequently fatal. Venom is not these snakes' main tool of defense. In fact, its role as a defensive weapon is incidental: these snakes are shy, non-aggressive and don't throw the first punch. Rattlesnakes use their rattles to warn potential predators who venture too close and only strike when the scary guys don't back off. They sometimes don't even open their mouths during defensive strikes, and their defensive bites are often venom-less. Gaboon vipers usually bite only when they're stepped on or otherwise manhandled. Their main mode of defense is camouflage -- the pattern on their skins allows them to blend in with the forest floor. Rattlesnakes are ovoviviparous -- their babies hatch from eggs inside their moms' bodies. They can have up to 60 babies at once, but usually have closer to 10. They may breed every year after they come out of hibernation in the spring. They spend their winters hibernating in communal snake dens shared with other rattlesnakes and unrelated species of snake. Gaboon vipers are viviparous -- they give birth to live young without incubating them inside eggs. Gaboon viper moms have 15 to 40 babies every two to three years. Since their habitat is warm year-round, Gaboon vipers don't hibernate. The main enemies of adult rattlesnakes and Gaboon vipers are humans. Though many species of rattlesnake are endangered, they're routinely slaughtered in many states during "rattlesnake roundups" and killed by individuals out of fear. Gaboon viper numbers are declining due to habitat destruction and collection -- oddly enough -- for the exotic pet trade. Young rattlesnakes are eaten by birds, such as roadrunners. Kingsnakes and opossums are immune to their venom and also eat them. Predators of Gaboon viper babies aren't entirely known, but are likely to also include birds and other reptiles.